Dargaville (Māori: Takiwira) is a town in the North Island of New Zealand. It is situated on the bank of the Northern Wairoa River in the Northland region. 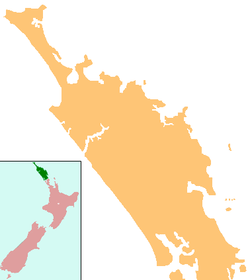 The town is located 55 kilometres southwest of Whangarei. The town was named after timber merchant and politician Joseph Dargaville (1837–1896). Founded[when?] during the 19th-century kauri gum and timber trade, it briefly[when?] had New Zealand's largest population. Te Houhanga Marae and Rāhiri meeting house is a traditional meeting place for Te Roroa and the Ngāti Whātua hapū of Te Kuihi and Te Roroa. The nearby Ripiro Beach has the longest unbroken stretches of sand beach in New Zealand, and is largely drivable from one end to the other. This beach is home of the famous local shellfish delicacy called the toheroa. Overexploitation in the 1950s and 1960s caused the population of the shellfish to decline enough that public gathering of the shellfish is now prohibited. Dargaville is situated by the Wairoa River, with boat moorings adjacent to the town centre. The river is tidal when it passes through Dargaville. ^ Discover New Zealand:A Wises Guide (9th ed.). 1994. p. 15. ^ Carbery, Sara. "Te Kaitiaki Toheroa". Retrieved 1 August 2018. ^ a b "Climate: Dargaville - Climate graph, Temperature graph, Climate table". Climate-Data.org. Retrieved 2014-01-23. ^ "Dargaville, New Zealand: Climate, Global Warming, and Daylight Charts and Data". Climate Charts. Archived from the original on 2013-09-19. Retrieved 2014-01-23. ^ Ryburn, Wayne (1999). Tall Spars, Steamers & Gum. Auckland, N.Z. : Kaipara Publications. p. 165. ISBN 0-473-06176-7. ^ "Principal's Message". St Joseph's School. Archived from the original on 2008-10-14. ^ "Dargaville". NorthTec. Archived from the original on 5 June 2009. Retrieved 4 March 2010. ^ "Mr R. E. Hornblow". The New Zealand Herald. LXXIV (22866). 22 October 1937. p. 14. Retrieved 7 September 2016. Wikimedia Commons has media related to Dargaville. Wikivoyage has a travel guide for Dargaville. This page was last edited on 4 April 2019, at 07:54 (UTC).